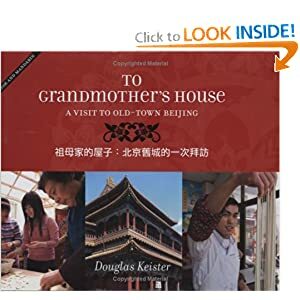 To Grandmother’s House: A Visit to Old-Town Beijing by Douglas Keister is a photographed journey of two girls as they head to laolao’s house for a meal. Written in both mandarin and English it depicts some aspects of daily life in Beijing. Bear requested it daily. It included a recipe for dumplings, but it seemed a little daunting to me. It mixes in mandarin words within the story and I liked sharing those with Bear. 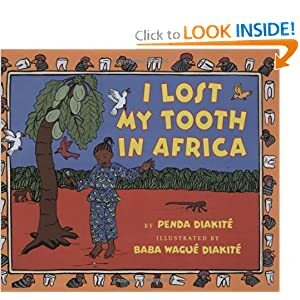 I Lost My Tooth In Africa by Penda Diakite is about a little girl from Portland who travels to Mali to visit her relatives. After losing her tooth there, the tooth fairy brings her a chicken, as is the way in Mali. This book was also requested daily. It also depicts a bit of life inside a small village and the illustrations are done in a folklorish manner. This book is special because the author/illustrator team is a daughter/father one. With both books, we talked about the countries portrayed in the books and we found the countries on the map. Bear looked through her Africa box. I have yet to make her an Asia one. I’m hoping to pick up my mementos from my high school trip to Japan when we visit my parents in a few days. To see what others are reading, visit What My Child is Reading. Okay, I didn't comment like I thought I had. I love books like those that have a nice simple story in a different culture. Interesting selections! We always make sure to read at least one geography book each week. I hope you will deliver on your idea of MTH unit studies 🙂 By the way – I sent you postcards about a week ago, I hope you received them! My kids love reading/hearing stories from other countries. They are some of my older kids favorite memories.